GenScale has managed to assemble the raspberry genome on . 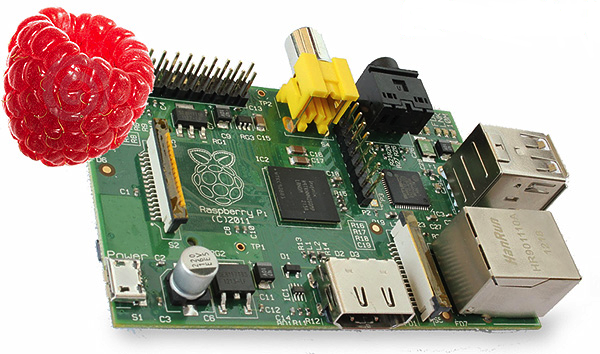 . . the eponymous Raspberry Pi, a mini-computer with only 512MB of RAM. The goal was essentially to demonstrate the dramatically low memory footprint of GATB. We are very grateful to Joshua Udall from Brigham Young University for providing us sequencing data from the raspberry genome. In total, we used 175 million DNA Illumina paired-end reads. The reads were 101 bp long. We discarded quality information (FASTQ->FASTA) and compressed the reads using gzip (total file size of 7 GB). A SDCard of 64 GB was used to store the reads and all other temporary files for assembly. This page describes our experiments in terms that should be familiar to bioinformaticians. To those unfamiliar with genome assembly, the following is a short technical introduction. A k-mer is k consecutive DNA nucleotides. Given many k-mers, a de Bruijn graph is a directed graph where each k-mer is a node, and there is an edge whenever two k-mers exactly overlap over (k-1) nucleotides, e.g. AGT->GTC (k=3). de Bruijn graphs are widely used to assemble genomes from sequencing data, as one can show that, under some hypotheses, the genome of an organism can be fully reconstructed by finding an Eulerian path in the de Bruijn graph. We ran the software Minia version 1.5418 to perform assembly using a de Bruijn graph approach. Minia uses a cascade of Bloom filters as the primary data structure to store k-mers, very efficiently. It also stores a sparse set k-mers explicitly to remember which nodes were visited in the graph. The value of k is critical in assembly. We used Kmergenie to determine that the optimal k for this dataset was 75. However, we were unable to set k=75 for the Raspberry PI assembly, as the assembler ran out of memory. Consider that storing a nucleotide requires at least 2 bits, thus a k-mer requires 2k bits. As our implementation uses multiple of 64 bits, storing each 75-mer would require 192 bits (24 bytes). Minia had to store roughly 8 million k-mers explicitly for this assembly, i.e. 183 MB of memory with k=75. This was in addition to the Bloom filter, which used around 280 MB of memory. The total exceeded the amount of memory available on the Raspberry PI (512 MB minus the memory used by the operating system, Linux). We therefore used k=31 in our assembly, which is the largest odd k so that k-mers can be stored in 8 bytes. The most time-consuming step was the first step, k-mer counting, using the low-memory and low disk space DSK algorithm. Minia usually creates high-accuracy assemblies (with little to no large-scale misassemblies and some mismatches). However, as no reference genome was known for this organism, we were unable to assess the accuracy of this assembly. The raspberry genome appears to be highly heterozygous, hence both Minia and SOAPdenovo struggled to produce long contigs. Keep in mind that this experiment was made informally, for demonstrating feasibility on a Raspberry Pi; a different assembly strategy would have been recommended if the end goal was to produce the best possible assembly for the purpose of biological analysis.